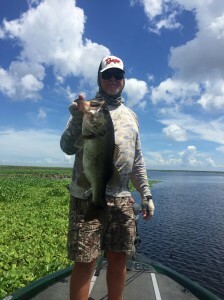 The last two weeks on Lake Okeechobee the fishing has been better than expected. In the middle of tropical storm season, the Lake has risen almost 1 1/2 feet. The water Temp is back into the 90’s. The catch limit is an easy outing in the Kissimmee grass casting with spinner baits and swim jigs in the early morning up to about 7:30am. After sunrise, then my recommendation is to just continue to flip all day. Every day I am on the water before 6:00am and will share that these fish have fins and are swimming around! Where I was hitting the 7lbs bass one day, I hit the smaller ones the next. I do know there are a lot of fish in the East area of the Lake, Kings Bar, and Grassy areas. I will continue, as I do every day to be your Lake Okeechobee fishing warrior and find the best catch for you and share where, how and when I hit them. They are out there!